Jamelle Elliott was a Forward for the UConn Huskies from 1992 – 1996. She was a key member of the 1995 National Collegiate Athletic Association Championship Team that went undefeated with a 35 win and 0 loss record, when UConn won its first National Championship. Jamelle was the second player in UConn history to reach 1,000 points, and 1,000 rebounds, and played in 135 games, never missing a game in her four collegiate years. Jamelle is entering her 10th season as an assistant coach at the University of Connecticut, and has experienced four more NCAA Championships, seven Big East regular season titles, and seven Big East Tournament Championships. I had the pleasure of meeting Jamelle in October 2006, as she reflected on her basketball career experiences as a player and coach. Jamelle was introduced to basketball by her cousin Adrien Elliott, who Jamelle looked up to as a youngster. Adrien went to H.D. Woodson High School in Washington DC. Jamelle attended summer camp one year with Adrien, and that’s when Jamelle really became interested in the game. She joined her junior high school basketball team, and also joined an Amateur Athletic Union team. Jamelle felt there were three or four players who were better than she was on her high school team, so in order to get noticed she made it her role to do the things that really didn’t show up on the stat sheets but were still needed to win games. “By not being the best player I had to figure out what I needed to do to help the team and I was able to rebound, pass, be enthusiastic, and do a lot of little things.” Her high school team was successful in winning two consecutive state championships. 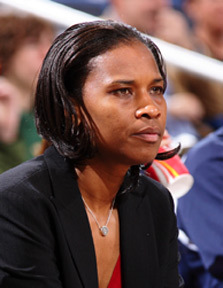 While Jamelle was playing on a summer league during high school, Coach Auriemma happened to come to the small gym in Washington, DC with Georgetown University’s head women’s coach Pat Knapp. “Coach Auriemma saw me, and he asked somebody who I was, and the rest is history. I really liked what he had to say, and where he wanted his program to go. 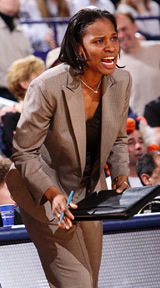 UConn had just gone to a NCAA Final Four in 1991 so the program was up and coming and I wanted to be a part of that.” Other colleges that were recruiting Jamelle were Georgetown University, Syracuse University, Temple University, and George Washington University but she felt most comfortable with Coach Auriemma, and how he wanted his program to develop. When Jamelle arrived at UConn it was a huge adjustment. Storrs, Connecticut where you’re greeted by green pastures and cows was the opposite of inner city Washington, DC where you went through a metal detector going into school each day, and people were selling drugs outside your home and school. “Luckily I had a coach and some assistant coaches, and a team that was already in place for me to walk in and be a part of their family.” It was also an adjustment on the basketball court where Jamelle wasn’t used to the physical workouts or the mental toughness she had to put on herself. “While at UConn I had the opportunity to learn from Rebecca Lobo and Pam Webber (former UConn players), and win a National Championship in 1995, which was probably the best moment as a team in my collegiate career, along with going undefeated; 35 wins and 0 losses.” A memorable game for Jamelle was against Virginia in the game leading up to the Final Four in 1995. UConn had a big lead, 17 or 18 points but gave it up, and was down by 6 at the half. To come back, and win that game, and keep the dream season alive is a long lasting memory. After graduating from UConn with a Bachelors Degree in Business Administration, Jamelle took the following year off from sports, and pursued her Master’s Degree in Sports Management with an interest in some day becoming an athletic director of a college. She was also given an opportunity to work in UConn’s business office as a graduate assistant, a great way to gain experience. The following year an assistant coaching position became available at UConn, and Jamelle was a perfect fit for the position, “Once I stopped playing basketball, I still had a passion for it. I found that what better way to be a part of the game if you’re not playing than to coach, and that’s what I’ve been doing for the last 10 years. 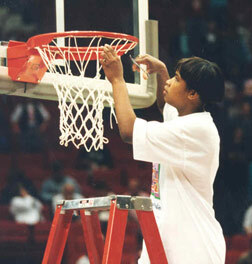 A memorable team that I’ve coached was the Sue Bird, Swin Cash, Tamika Williams and Asjha Jones team that won a National Championship in 2002 with a perfect record of 39 wins and 0 losses.” Jamelle had fun putting pressure on that team to match her 1995 team, and try to be undefeated to motivate them, and it worked.